The Cecilware MT1MINI frozen drink dispenser has a capacity for 11⁄2 gallons of product. 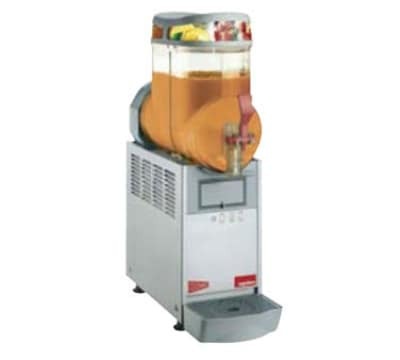 This machine is suitable for dispensing granita, frozen fruit juice, slushes, and other similar frozen products. An advanced magnetic drive system eliminates the risk of the motor burning out in the event that the product should freeze up. Built for easy maintenance, the Cecilware MT1MINI frozen drink dispenser has a 24 hour programmable defrost timer, allowing operators to set the defrost cycle to occur when their business is closed so the downtime will not cause sales to be lost. The machine's air filter is removable without tools to make it easy to clean periodically.